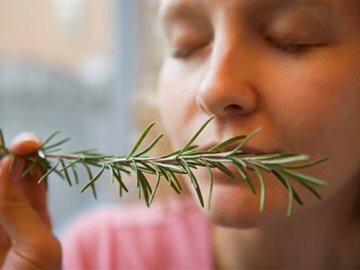 In a very interesting article written by Natalie Angier (of the New York Times), “The Nose, An Emotional Time Machine,” Ms. Angier cites some research findings (presented at the International Symposium on Olfaction and Taste) which explain how and why our sense of smell has the power to immediately take us back to a place, a person and a moment in time – making the memory as vivid and poignant as if it occurred in the present day. For example, whenever I smell carnations, I am instantly brought back to the family celebration held after my First Communion (I was seven years old), when my favorite aunt gave me my first bouquet of flowers ― a bunch of pink and white carnations. For me, carnations will always remind me of that sacred (and sweet) rite of passage. The scientific explanation is pretty straightforward: the olfactory bulb (located just above the nasal cavities, it is a structure of the vertebrate forebrain involved in olfaction, the perception of odors) is part of the of the brain’s limbic system. The limbic system, sometimes referred to as the “emotional brain,” is the area that is closely associated with memory and feeling. The olfactory bulb accesses the amygdala (which processes emotion) and the hippocampus (responsible for associative learning). Despite all these biological components, it is our conditioned responses which actually cause smells to trigger memories in our minds. When we smell something for the very first time, we automatically link it to a moment in time, a person, a thing, an event (sometimes all four). So, when smells trigger a memory from childhood, it is most likely because we experience some of our first smells when we are children. Whenever I smell a good pipe tobacco or a fine cigar, I think of bookshelves bending with the weight of books. I am brought back to a time when I was just a little tyke, sitting on my father’s lap while he puffed on his pipe and read to me snippets (whether I wanted to listen or not) from a current issue of the Foreign Affairs journal. He was trying to teach me, to open my mind to the world around me. Many decades later, I have a cigar lounge in my home – filled with bookshelves bending from the weight of books. Whenever I am in that room, I remember those serene days of my childhood. Another vibrant memory is evoked by the smell of spaghetti Bolognese. My favorite childhood meal. Sadly, I have never been able to recreate my mother’s special sauce. A few years back, I walked by a neighbor’s home and stopped in my tracks. From her open kitchen window, I heard the sound of onions sautéing and the smell of onions and tomatoes wafted towards me. It almost brought me to my knees. Suddenly, I was a little girl again and my mother was lovingly stirring the sauce, smiling at my exaggerated, comical facial expressions (I was trying to convey to her how much I loved the smell and how impatient I was to eat my spaghetti). I stood on the sidewalk for a while longer, just so that I could enjoy the whiff of sauce and the memories that it evoked. The next day, I knocked on my neighbor’s door and asked her for the recipe. She quite happily gave it to me. Strangely enough, I still can’t recreate it – quite exactly. Then again, my mother was one of a kind. This entry was posted in heatherfromthegrove, inspiration, lessons learned, other musings, spirituality and tagged À la recherche du temps perdu, cigars, conditioned responses, fathers and daughters, First Communion, Foreign Affairs Journal, Heather Joan Marinos, Heather Marinos, heatherfromthegrove, International Symposium on Olfaction and Taste, limbic system, Marcel Proust, memories, memory recall, Mothers and Daughters, Natalie Angier, New York Times, olfaction, olfactory bulb, pipes, Proustian phenomenon, scent, sense of smell, Smell. Bookmark the permalink.